Abstract This article examines social advertising’s discourse and representation of the “Other”, understood as any social or cultural group of people depicted in such advertising message. The article describes the features used in recent decades by social advertising to represent minority groups or groups of people in a situation of vulnerability or exclusion. 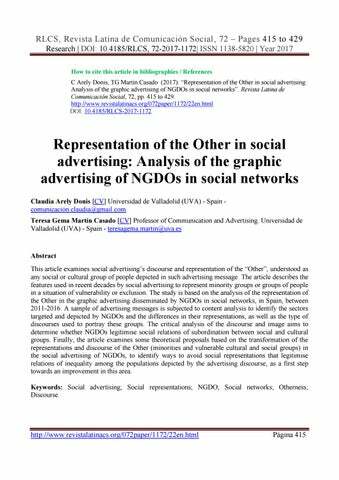 The study is based on the analysis of the representation of the Other in the graphic advertising disseminated by NGDOs in social networks, in Spain, between 2011-2016. A sample of advertising messages is subjected to content analysis to identify the sectors targeted and depicted by NGDOs and the differences in their representations, as well as the type of discourses used to portray these groups. The critical analysis of the discourse and image aims to determine whether NGDOs legitimise social relations of subordination between social and cultural groups. Finally, the article examines some theoretical proposals based on the transformation of the representations and discourse of the Other (minorities and vulnerable cultural and social groups) in the social advertising of NGDOs, to identify ways to avoid social representations that legitimise relations of inequality among the populations depicted by the advertising discourse, as a first step towards an improvement in this area. Keywords: Social advertising; Social representations; NGDO; Social networks; Otherness; Discourse. RLCS, Revista Latina de Comunicación Social, 72 – Pages 415 to 429 Research | DOI: 10.4185/RLCS, 72-2017-1172| ISSN 1138-5820 | Year 2017 international, to be able to establish whether the focus of the discourse changes between Spanish and Guatemalan NGDOs. 3. Methods 3.1. Methodological strategies According to the objectives, this research work is descriptive, comparative and confirmative  since it aims to analyse advertising representations, and classify the empirical reality of the content of advertisements, through the definition of categories. The reality will be observed to identify differences and similarities in terms of representation in the advertising messages disseminated by NGDOs. The analysis will be carried out from the point of view of the issuer of the message, to discover what it says, and how, about the populations depicted in the advertising messages. To this end, we use content analysis, which has been already used to analyse advertising messages and contents by such authors as: Maestro (2010), Martín Nieto (2009), Martín Casado (2010) and Arroyo and Baños (2013), among Others. The content analysis is based on the principles of critical discourse and graphic analysis (Van Dijk 2009, Abril, 2007), and on the generation of discourse by NGDOs (Mesa, 2000), to test the hypothesis on the existence, or otherwise, of power relations or inequality in the advertising representations. 3.2. Population and sample The population of this study consists of the graphic advertising generated by NGDOs that have been recognised as such by the Spanish Agency for International for Development Cooperation (AECID) . This is because these organisations are the best qualified, according to the Spanish government, to receive funding and carry out international development projects of at least four-year duration and receive budgets of over one million euros, so that their levels of management and thus communication have the necessary criteria to be selected as the population of analysis in this study. The sampling is non-probabilistic and purposive, because we considered that the NGDOs recognised by the AECID represent the ideal object of study considering that they are part of the group of organisations that are qualified to be selected to receive public funding for international cooperation projects and, therefore, must disclose their results publicly. We focused on the advertising discourses disseminated on social networks because the latter are one of the most used communication tools in this decade and are very accessibility for NGDOs and the target public living in cooperating countries. The units of analysis are the 1468 graphic advertising pieces published between January 2011 and June 2016 in the official accounts of the Spain-based NGDOs on social networks: Facebook and Twitter. The results are compared across the different NGDO sectors and based on the volume of ads published in that period of time, to identify differences in terms of representations and discourses, according to the number of publications and the target sector of the organisations in Spain. RLCS, Revista Latina de Comunicación Social, 72 – Pages 415 to 429 Research | DOI: 10.4185/RLCS, 72-2017-1172| ISSN 1138-5820 | Year 2017 passive and as followers, especially in educational and health care activities, in 63% of the international organisations and up to 80% on civil society organisations. -Other groups represented in relations of power Another group that is in a relation of power with the populations in need is professionals, who are usually associated with the fields of medicine and teaching, with a presence of 52% in civil organisations with less than 20 ads, 43% in religious organisations and 44% in international organisations with less than 50 ads. The other group is parents, particularly mothers who are taking care of their children in 31% of the civil society organisations, 38% of the religious organisations and 63% of the international organisations with more than 100 ads. -Protagonist voice The represented populations are often silenced. The organisations have the protagonist voice in more than 90% of the cases in all ad-amount ranges. The representation of empowerment in organisations linked to civil and international sectors reflect an increase in the appearance of non-empowered groups, between 54% and 57% of the cases. However, there is a balance between the images that show group as empowered and as non-empowered. An average of 50% in both cases. -Stereotypes Despite the fact that many ads do not present stereotypes, there are some pieces that still do so, mostly sexual stereotypes. The civil organisations with less than 20 ads have the largest percentage of ads that rely on stereotypes (38%). There are female stereotypes in activities dedicated to agriculture, domestic work and child care, while men are represented working in activities that require strength and as athletes. With regards to the relationship between cultures, international organisations represent the highest percentage of stereotypes (18.4%). Their ads show people from foreign cultures helping people from local cultures. The latter appear in a situation of disadvantage with respect to the former. -Campaigns’ theme The objectives of the ads include reporting results, raising funds, raising awareness, education and fair trade. In this sense, the main theme in civil and religious organisations is fund raising, with 25% and 30% respectively. The predominant theme in all organisations is awareness-raising and education for development, ranging from 30% in religious organisations to 42% in international organisations. These issues are associated with the most frequent type of appeal in the messages, which is the emotional appeal. The rational appeal is more common in ads linked to civil and international organisations of up to 100 ads, where the most frequent topics are research and reflection. Civil organisations of less than 20 ads have the highest percentage (23%) in subjects of reflection and research. The search for messages of denunciation of injustice or causes of poverty associated with the represented in the content of the ads showed that these messages are absent in more than 68% of the ads, across all ranges. RLCS, Revista Latina de ComunicaciĂłn Social, 72 â&#x20AC;&#x201C; Pages 415 to 429 Research | DOI: 10.4185/RLCS, 72-2017-1172| ISSN 1138-5820 | Year 2017 -Generation of the advertising discourse The charitable discourse stands out in civil organisations with less than 20 ads, with 36%, followed by the development discourse with 33%. In religious and international organisations, of up to 100 ads, the dominant discourse of development with 52% and 37%, respectively. In international organisations of more than 100 ads, the predominant discourses are development and charitable assistance, with 34% and 38%, respectively. Therefore, charitable assistance is the most frequent discourse in civil and international organisations and development in religious and international organisations. The first type of discourse is related to fundraising for projects and emergency situations, while the second shows the results of the projects, generally related to educational activities 5. Conclusions The cultures that are represented the most in the advertising of NGDOs are Sub-Saharan Africa and Latin America. Other populations that are also frequently represented are children and rural populations. International organisations represent refugees most frequently. The most represented groups are women and children, who are also legitimised as the most vulnerable in this advertising. International organisations published the largest number of ads on their social networks, in contrast to civil-local organisations, which publish the smallest number of ads in these spaces. This can be associated to the larger budget of international organisations and, therefore, their greater attention to the communication area. The publications of all organisations have showed a constant increase in the past five years, which suggests that the use of social networks as an advertising medium for these issues will tend to grow in the coming years. Colour photography is the most widely used format for the representation of the populations and it is characterised by the medium shot and people looking directly at the camera. The shots are planned in advance and have a clearly persuasive intention. Representations of gender, and the power related to it, stands out in general for the balanced inclusion of men and women, and because they are depicted performing the same activities in the same spaces. However, some ads still show women in situations of disadvantage with respect to men. There are representations that perpetuate stereotypes, like the image of women in the private and domestic sphere and taking care of children, while men are shown to be strong and working in the public space. Stereotypes are less frequent in the representations of different cultures than in the representations of different local groups. However, when other cultures appear in all types of organisations, the populations of the South appear in disadvantage in relation to the populations of the North. The stereotyping of cultures consists in showing the foreign cultures of the North performing activities associated with development and helping populations from the South that are in situations of disadvantage. Advertising discourses that denounce the causes and overall co-responsibility of the situations of inequality and injustice that are shown in the representations of the affected populations. Empowered discourses and representations, where the protagonist voice is given to the groups living a situation of vulnerability. Representations that avoid hierarchical relations or subordination between cultures, and instead show teamwork between cultures, in case more than one culture is shown. Representations that reflect the actions carried out by the affected populations for the transformation of their own realities in such cases as natural disasters and emergencies. RLCS, Revista Latina de Comunicación Social, 72 – Pages 415 to 429 Research | DOI: 10.4185/RLCS, 72-2017-1172| ISSN 1138-5820 | Year 2017 empowerment of poor and excluded groups, Northern NGDOs focus on campaigns of political pressure to change the pattern of underdevelopment of the North and the policies of industrialised countries that contribute to develop and perpetuate unjust North-South relations” (Mesa, 2000:23). As stated in the Code of conduct for NGDOs in Spain (2014), they should include advertising discourses that encourage participation and social actions and mobilisation for the denunciation and transformation of the policies that affect the realities of inequality. In this way, the advertising of NGDOs can transform the representation of the protagonist of the message, can encourage the receiving public to participate, and can avoid the depiction of the populations in need as dependents. Two trends are configured in advertising, “one is centred on the work values of the organisations (solidarity, cooperation, education) and the other on the messages that focus on the receivers rather than on the subjects or the problems, to avoid inappropriate representations that discredit them [...] Now recipients become the subject of the current social advertising” (Nos Aldás, 2007: 201). The receiving public of the advertising of NGDOs, who are located in the so-called developed societies, as well as the populations who are in situations of exclusion or marginalisation must use this discourse to transform together, at the international level, the actions and policies that eventually affect all populations. This type of discourse does not involve power relations or subordination, since any gender, intercultural and social relations are seen as interdependent realities worldwide, regardless of the group to which it belongs. Despite the existence of proposals to address the discourse of NGDOs from other approaches that do not legitimise power relations, such a change has not occurred yet, so new questions of the causes arise and allow the discourses of development and charitable assistance to prevail and dominate in this sector. 7. Notes 1. Method taken from Gaitán (1998). 2. Information available at the official website of AECID. Retrieved on October 2016 from: http://www.aecid.es/ES/la-aecid/nuestros-socios/ongd/calificacion 8. References Abril, Gonzalo (2007). Análisis Crítico de textos visuales. Madrid: Editorial Síntesis. Arroyo, Isidoro & Baños, Miguel (2013): “Tendencias de la Comunicación del Tercer Sector en la web 2.”, en Revista de Comunicación y Tecnologías emergentes Icono 14, Vol. 11 No. 2. Pp.331356. Retrieved in November 2016 from http://www.icono14.net/ojs/index.php/icono14/article/view/556/429 Ballesteros, Carlos (2001): Marketing con causa, Marketing sin efecto. Madrid: Universida Pontificia Comillas. RLCS, Revista Latina de Comunicación Social, 72 – Pages 415 to 429 Research | DOI: 10.4185/RLCS, 72-2017-1172| ISSN 1138-5820 | Year 2017 Alicante. Valencia. Retrieved in June 2016 from http://www.tonosdigital.com/ojs/index.php/tonos/article/view/1139 Lucerga, María (2005) “Cuando IO Soy la marca. La solidaridad como construcción publicitaria”. In Revista Electrónica de Estudios Filológicos, N. 9. June 2005. Retrieved in December 2015 from https://www.um.es/tonosdigital/znum9/estudios/ongtonos.htm Maestro Renedo, Rosa (2013): Representaciones sociales de las personas mayores en la publicidad: Análisis de anuncios en prensa no diaria en España entre los años 1980-2010. PhD thesis. Valladolid: Universidad de Valladolid. Martín Casado, Teresa Gema (2010): El tratamiento de la imagen de género en la creación del mensaje publicitario de medio prensa a comienzos del siglo XXI. PhD thesis. Universidad Complutense de Madrid. Madrid: Facultad Ciencias de la Información. http://eprints.ucm.es/28295/1/T35759.pdf Martin Nieto, Rebeca (2009) “El tercer mundo representado. La imagen como nido de estereotipos”. Revista de comunicación y Nuevas Tecnologias, ICONO 14, No. 13 pp.151-171. Madrid. Retrieved in March 2016 from http://www.icono14.net/ojs/index.php/icono14/article/view/321 Martínez Guzmán, Vicente (2003). “Discurso y sensibilización: entre la indignación y la esperanza”. In Benet, Vicente J. & Nos Aldás, Eloísa (Eds.) (2003): La publicidad en el tercer sector. Tendencias y perspectivas de la comunicación solidaria, pp.203-228. Barcelona: Icaria Mesa, Manuela (2000): “La educación para el desarrollo: entre la caridad y la ciudadanía global”. Revista Papeles No. 70 (pp.11-26). Madrid: Centro de Investigación para la Paz. Retrieved in May 2016 from http://www.ceipaz.org/images/contenido/Ed-entre%20caridad%20y%20ciudadania.pdf Nos Aldás, Eloísa. (2012). “Publicidad y Culturas de Paz: Actores, discursos y estrategias”. In Cortés, Alfonso & García, Marcial (eds. ): Comunicación y Cultura de Paz, pp.105-118. Granada: Editorial Universidad de Granada. Ortega, María (2007): Estrategia de Educación para el Desarrollo de la Cooperación Española. Ministerio de Asuntos Exteriores y de Cooperación. Madrid: EGRAF S.A. Pagola Carte, Juan. (2009). Comunicación para el Desarrollo: La responsabilidad en la publicidad de las ONGD. Donostia-San Sebastián: Diputación Foral de Guipúzcoa. 2009. Piedra Guillén, Nancy (2004). “Relaciones de poder: leyendo a Foucault desde la perspectiva de género” Revista de Ciencias Sociales (Cr), vol. IV, núm. 106, 2004, pp. 123-141. Universidad de Costa Rica San José, Costa Rica Pinazo, Daniel. (2005). Las causas de la pobreza en el Tercer Mundo: imagen social y conducta de ayuda. Castelló de la Plana: Publicacions de la Universitat Jaume I. Article received on 22 on January 2017. Accepted on 24 March. Published on 29 March 2017.